Home > Help Desk > Our Company > Newsletter Archives > November 2014 - Small Porches... Big Impact! 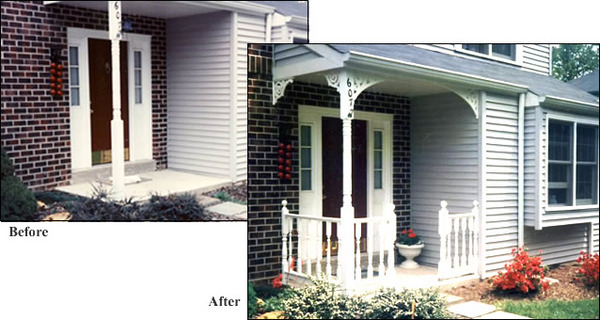 Even a small porch can dramatically transform your home! The porches featured in this newsletter are small, yet still impactful. Not only do they offer just enough shelter from the rain while fumbling for your keys, they also add character and style far bigger than their footprint. On the porch shown above, the Flying Circle Gable Decoration, MD1416 Running Trim as fascia applique on the eave, Post Face Brackets, 2206 Running Trim between Brackets (separated by Drops), an intermediate Newel Post in the balustrade section, Running Trim beneath the bottom rail, and additional Appliques on the horizontal fascia all work wonderfully together! Also, note Half Porch Posts used at the walls. They are installed on plain trim boards that are slightly wider than the Posts. This is the best approach for most house surfaces, as it provides a flat surface to receive the Posts. 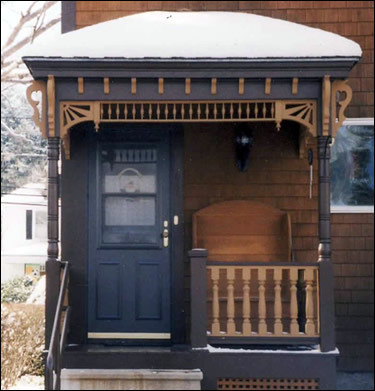 Above is another splendid example of a small porch. We love that the gingerbread was painted in a "raw" wood color as if stained while being better protected with paint! SR #4 Spandrel Brackets and 7" Classic Spool Spandrels run from Post to Post while 23" Cupids Key Post Face Brackets and Callie Repeating Cornice Brackets create the Third Dimension at the top of the Posts. 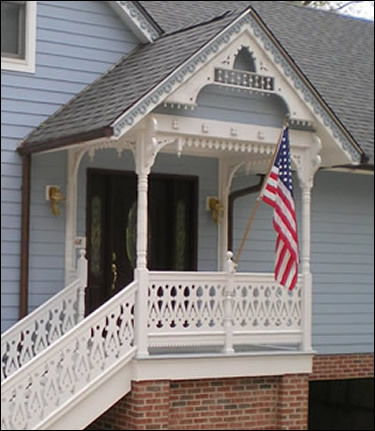 Our 5" Traditional Porch Posts anchor the balustrade (railing system), which is made of P3 Handrail, SR3 Subrail, 3'' Traditional Hemlock Balusters, and Sloped-top Bottom Rail. The photos just above show one of the tiniest porches getting a face lift that prompts the owner to say, "This really improves the look of this small porch. Thank you for all the help!" She used our Arch Spandrels and Plain Square Balusters plus a Screen Door and Post Wrap to achieve this look. 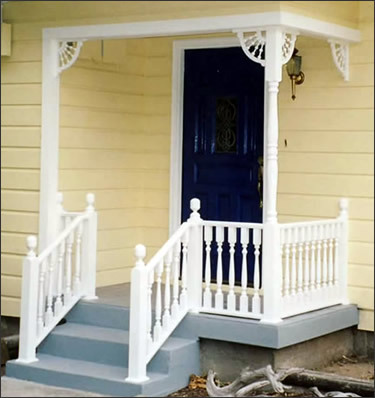 And, below, this cheery porch got a big dose of style in a small space with the addition of Fan Brackets, Turned Balusters, Newel Posts, and Railings. KDAT stands for Kiln Dried After Treatment, and it's a huge improvement over regular pressure treated lumber. YellaWood® KDAT Boards give you the luxurious appeal of composite or Cellular PVC flooring while maintaining a completely natural look at a fraction of the price! If you want to avoid almost all routine maintenance (including initial staining and/or water repellant treatment)... don't like cracks, warps, splinters, rot, or insect damage... but do want a little scratch and stain resistance... AND you want ALL this for a great price, then TimberTech Composite Deck Boards are for you! 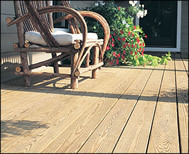 If you also want superior scratch and stain resistance, minimal color fading, superior resistance to mold and mildew, and would like to save a bit over the cost of comparable colors of AZEK® Cellular PVC Deck Boards (or just like one of TimberTech's colors better), we recommend TimberTech's Capped Composite Deck Boards. One of our owners, Gregory, was a guest on The Porch Idea Network's podcast series at Front Porch Ideas & More. There will be three podcasts featuring Gregory as he shares his porch knowledge. Click to listen to (or download for later) the first one now. "I just recently completed building the front porch railings. There is 100% improvement in the looks of my front porch. Thank you so much for shipping my order." A porch doesn't have to be physically large to make a BIG impression! Notice in the after photo below, the use of Newel Posts on either side of the steps. This treatment permits the balustrade to continue across the front, allowing more decor in a small area. "We were pleased and surprised when we received your catalog to see you featured our home improvement done approximately 1988. Enclosed are photos from 2006 proving your product holds up great!"